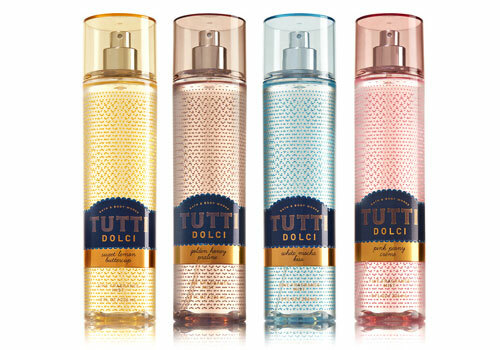 Tutti Dolci Collection by Bath & Body Works - A new collection of delicious fragrances. Bath and body Signature collection of products with four new scents of Golden Honey Praline (caramel, praline, honey), White Mocha Kiss (vanilla mocha, coconut orchid, marshmallow), Sweet Lemon Buttercup (lemon, buttercup, meringue, sugar), and Pink Peony Creme (peony, currant, amber). Indulge in the sweetness of this perfume ensemble. Available in shower gel, body lotion, body cream, and fragrance mist from Bath & Body Works stores. Golden Honey Praline - Cozy up to creamy caramel & praline musk drizzled in golden honey. White Mocha Kiss - Fall in love with rich vanilla mocha & coconut orchid wrapped in marshmallow crème. Sweet Lemon Buttercup - A sweet treat of juicy Meyer lemon, creamy buttercup petals & fluffy meringue sprinkled with sugar. Pink Peony Crème - Our prettiest blend of blushing peony blossom, pink currant & white amber dipped in nectar.